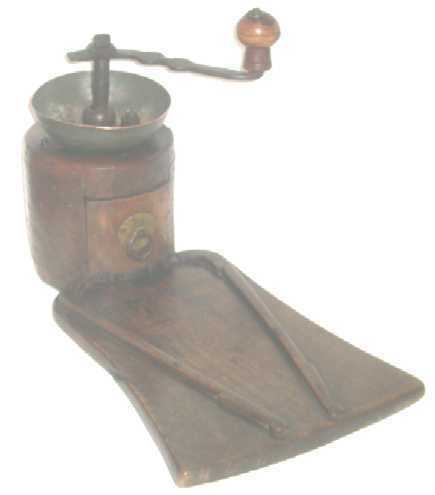 This is perhaps the most intriguing Coffee Mill we ve ever seen! In addition, it is in fine condition for a very old, often used household item. It is definitely not a production piece, but rather the artistic output of a multi-talented craftsman. An example of a utilitarian item elevated to Folk Art through the artistic abilities of the maker. The wood is walnut of very heavy construction. The body is made of pieces to 1 inch thick all hand formed. The flat base is attached to the vertical cylinder by two heavy hand wrought screws, the flat heads of which serve as feet for the mill. The flat wooden base is the third support point at the front of the wooden extension. The cup or circular bowl which holds the beans is hand wrought copper with a turned over edge flattened against the bowl on the outside with about 3/32 of an inch overlap. The copper has its original tinning fairly well intact, giving a pleasing pewter-like appearance over the partially visible copper. All of the grinding mechanism is scratch wrought and very well thought out. The two screws that hold the grinding mechanism together are also hand wrought and have two heavy slots which allow for adjusting the grind. Actually, one can also adjust from chips to fine grind by finger twisting the screw. The vertical shaft that is attached to the hand cut grinding head is topped by a handle that is a work of art, crowning off the beauty and quality of the entire piece. The container that collects the ground coffee is deserving of description also. It is made of four wooden pieces, namely a 7/8" thick walnut front, curved to match the round mill, a 3/8" thick bottom piece curved to match the front and vertically carved on the round front edge. The curved front piece sits on the curved base which is nailed from the bottom with three forged nails. To this walnut assembly are nailed two pine pieces to form the sides. They are radiused from front to back, forming a wooden scoop, the top edge of which has been tapered to a "knife" (not sharp) edge. There are 109 impressed 3/16" diameter circles on the exterior of the wood surfaces . . . each with a punched center dot . . . a very nice decorative touch. Now, the scoop or drawer handle . . . This starts with a hand formed circular escutcheon of brass 1-1/4" in diameter. There is an iron forged ring made from a straight piece of iron flattened at each end, pointed, overlapped and then forge welded together about 1+ inch in diameter. 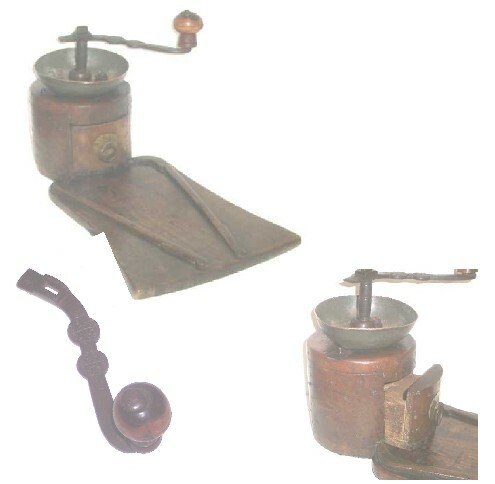 It passes through a forged eye which started as another straight piece of flattened and tapered iron, attached through the escutcheon and the front of the scoop, then bent flat on the inside, tying all pieces together. The maker must have had a guarantee of eternal life in mind with the strength of construction he employed. There are two carved pieces attached to the flat, elongated base . . . one on each side. Each is attached with three flat-headed wrought nails as with all fastenings on the entire assembly. No shrinkage cracks either. Whether pure d cor or functional in the eyes of the maker I cannot of course know, but they certainly add an interesting element to the assembly. The last item is the handle that operates the milling shaft. It is a work of wrought iron art. There is a gentle "S" curve to the overall 7" length of the handle. It has a slot cut into it which mates to the milling shaft. There are two medallions shaped from the handle forging. On them are chisel worked patterns that are just "neat". There are three flower-like chiseled forms also . . . one between the medallions and one diametrically opposed at the far side of each. The slotted end is chisel engraved with a wavy "snake-like" design on each side of the slot and at the slot s end is another plant-like engraving. The handle is also impressive. Worn to a warm glow, it is a beautifully light/dark contrast piece of walnut. A spacer of 1.5" diameter ends in a tapered " long shaft at the bottom where it meats the crank. A forged vertical extension shaft is common with the crank proved the center axis for the attachment of the walnut handle. This is peened over a free-floating dome-shaped forged washer which permanently weds the elements. Last but not least is the patina. I see no evidence of any finish. The warm, rich glow that exists now appears to be the result of time and usage. No varnish residue exists and definitely no paint. Even the iron has the beautiful dark, almost-polished look that comes from time and handling. Finally . . . if you get this far, thanks for bearing with me. I am so impressed with this piece I feel it s my debt to its creator to try and give him the credit he so richly deserves. I firmly believe he lived in the 18th century which gives a nice spread that few who view his work will debate the dating. Among his strengths were definitely caring, patience, creativity, and talent. I think also that there may have been a love story that deeply motivated him. How bout you?